Sheet metal is nothing new for BricsCAD, but with the release of V19, BricsCAD Mechanical gives you a whole new way of working with sheet metal. Today I’m going to talk you through getting started, importing non-native files, Associative Unfolding and working with curves. 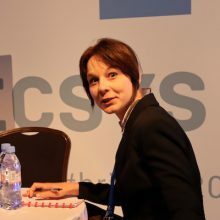 I’m pretty excited about Bricsys’ developments and here’s why you should be too. There are tons of ways to start a sheet metal project. The first is to start with a solid object. Use the Shell command to hollow out the object. Then use SMCONVERT. 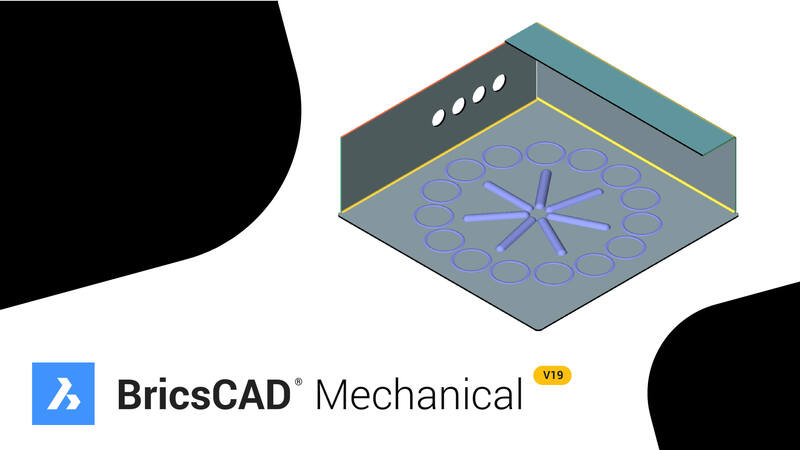 With V19, BricsCAD Mechanical detects straight holes and automatically converts them into features. 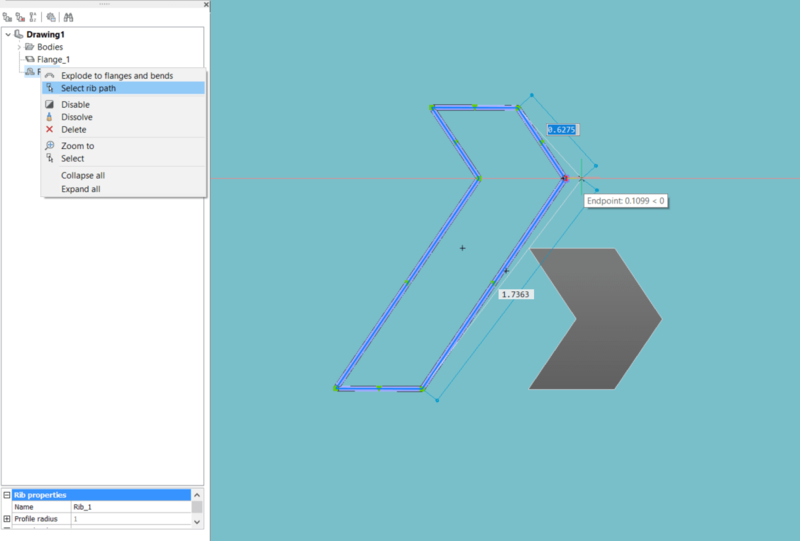 SMBENDCREATE creates bends on hard edges or junctions. SMFLANGECONNECT creates flush junctions. SMJUNCTIONSWITCH changes the orientation in which the panels meet. As an alternative, start from 2D, draw a closed polyline and then hit SMFLANGEBASE. From there use the SMFLANGEEDGE to form new sides by extending an edge. View the complete tutorial guide. Importing .stp files? Surely not! Thanks to the Communicator for BricsCAD, BricsCAD Mechanical doesn’t care if you’re importing native .dwg files, .stp files or something more exotic from external CAD packages. It’s still possible to edit and manipulate the file. See it in action here. I tested out Catia™, SolidWorks and AutoCAD® formats and I was super impressed. You can now automatically PARAMETRIZE .stp files with a single click. Choose from our Library of 30,000+ parametric component parts to add a range of features to your sheet metal or create your own. In V19 SmParametrize now recognizes straight hole angular arrays! On the left the 3D representation, on the right, the Associativity unfolded representation that highlights errors in the design. 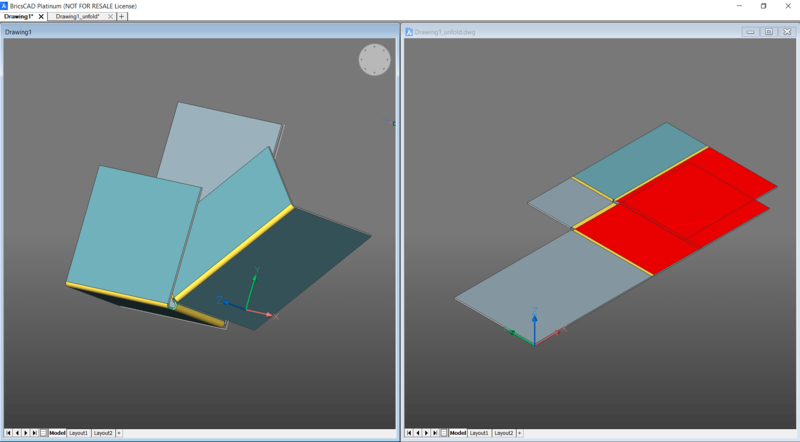 Basically, it means that you can simultaneously edit sheet metal in a 3D and a flattened view. Use the SMUNFOLD – Associative Unfold Body command. Then Tile Vertically. This makes optimizing material usage and machining time much faster and provides instant feedback. Make cuts on the flattened surface and watch as BricsCAD instantly changes the 3D sheet metal model view, or work on the 3D sheet metal view and see the changes appear on the flattened view. Create complex, non-standard bends, and corner relief cuts simply. Problem layouts are colored red and of course, all colors are fully user-customizable. All this sounds too good to be true? Then watch the masters at work at Bricsys 2018. Calculate junctions on curves with SMJUNCTIONCREATE. That’s right, BricsCAD Mechanical really can produce junction cuts on curved hard edges, including elliptical and spline cases. V19 has taken the functionality of SMSPLIT to brings users the option to split lofted bends with SMSPLIT. Create ribs easily with SMRIBCREATE and edit ribs, with our new Rib Path Detection. This works even with files imported from external products. Use the Mechanical Browser to select the feature and then right click Select Rib Path. BricsCAD AI places an editable path along the rib of the sheet metal and is as editable as any, standard 2D path. Edit ribs with the new automatic detection. It’s as easy as moving a point. BricsCAD Mechanical now automatically removes unnecessary features when a sheet metal part is edited. Improved Quad settings mean that only the most frequently used commands are displayed, more specific and obscure commands are still available, but are hidden out the way.